This month brings the first official days of fall; and in light of the waning daylight hours, it seems appropriate to take a moment to get to know our 'boys of summer' a little better. Topher Gent is one of the newest faces around The Yard; and Elliot Berry is also a new addition to The Steel Yard team. endlessly reformulated in various dishes. The Steel Yard: When did you get involved at The Steel Yard? Topher Gent: Well, M was working for Brian before me and she ended up putting up signs at RISD looking for help at The Yard. And I was in Providence for the summer, and then she connected me with Brian and it worked out. Elliot Berry: I got involved at The Steel Yard in early June, after having finished my previous year at Hampshire College. 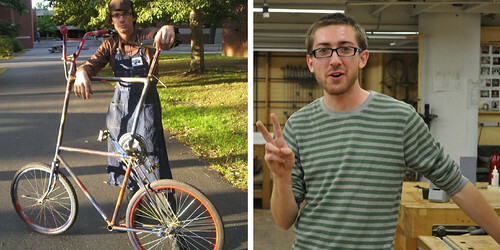 TSY: Topher, you're the Assistant Shop Tech for Brian, do you have a similar role at RISD? TG: Yeah, well I have been the Teaching Assistant for welding classes at RISD, and I also monitor for open studio sessions, and have also worked for the shop tech at RISD too. TSY: You're reputation does proceed as being a really good shop monitor. TG: Really? People like me, I guess... I just help when I can. TSY: And Elliot, I see you doing so many different things around The Yard, can you tell me a little bit about what you've been doing. EB: My daily tasks, shop wise, have been taking on specific projects and working on them when I find the time; my biggest project for Brian was working on the Iron furnace, which had various features that had to be fabricated. I was excited to be doing all sorts of fabrication for it: welding, blacksmithing, and so on. TSY: You also worked with the previous Volunteer Coordinator, didn't you? EB: Yeah, under the care of Jackson, I coordinated volunteers from Ohio State, mended aspects of the building, took field trips to the hardware store, and so on. TSY: Topher, what are your daily tasks in the shop? TSY: Have you worked on many projects? TG: Yeah, a few. Usually there are little things, like putting bases on anvils, or we've been dabbling with getting a sink for the ceramics people that would be a water-recycling sink. But, now the forge is taking precedence over that. TSY: What have some of your favorite projects been? TG: The forge... It's going to be big and really cool to watch it pour some iron! TSY: Yeah, it's a neat project because you have a pretty immediate deadline... Only about a month until the Iron Pour! TG: Yeah, and we have to make sure that it works before then! EB: My most challenging and favorite project was, of course, Camp Metalhead. I absolutely love kids, and it was a blast meeting teens who were totally pumped about the same darn things I was. It was difficult occasionally finding a place for myself in the camp; I wish I'd taught more things, or had a specific goal to work towards, so I sort of just lended a hand when people needed it, which was fine. I think education, art, and fabrication are very important, and I'm really glad there's a program available for all different kids such as the group we had that teaches the things it does. I was completely surprised we were able to teach what we did in the time we had, AND still have time for all the special tours and such that we did, which was a pure blast for me. TSY: What's your favorite tool, and why? EB: My favorite tool is decidedly Jacque Derrida's method of Deconstruction; never has a tool of literary analysis been so appropriate or meaningful. TG: That's a hard one! I don't think I have a favorite tool; I would probably divide the way that I have favorite tools into categories, such as hand tools versus power tools. And that would be subdivided into woodworking tools and metal working tools. My favorite woodworking tool would be the block plain, it's a solid, beautiful tool and is so much fun to use and is so gratifying. My favorite metal working tool... I do find the 4.5" grinder quite versatile, and I like it, but I do love welding! I like the TIG welder way more than a MIG welder! I love TIG welding; I could TIG all day and be happy about it! TSY: You're both graduating from college this upcoming year... what does the future hold for you two? TSY: Are you thinking about what your thesis show is going to be like Topher? TG: Yeah, I've been thinking about my thesis, there are a lot of different directions that I can take... Which is part of the beauty of the Furniture Department at RISD. So, I've been thinking about anything from making glasses, to a bow and arrow that I recently made and continuing with that idea. But, there's also a good chance that I'll be making sculptures of some kind. Or maybe furniture. TSY: And Elliot, what are your plans? EB: After I graduate, I'd love to go out and do some work in fabrication. I hope I can get a job as exciting as, for instance, the one at mid-ocean studio; I'm someone who likes overcoming a myriad of unique problems through metalworking, and something like that would interest me. Any sort of shop where many different types of things are being made... I don't see myself in a factory or the like. TSY: Would you consider coming back to Providence ever? EB: Yeah, I could eventually see myself in Providence again, or even at RISD. I would like to take at least a brief break from school. TSY: So, it seems that you both have diverse studio practices. And you're both investing yourself in different medias from object making, to philosophy, to non-functional sculptural artwork, or furniture. What have you each been thinking about while you've been working on these different thoughts? EB: At Hampshire, I am studying an extremely vague mix of Philosophy, Industrial Design, and Art; as it stands now, my final project is going to be a large-scale installation, the nature of which has not been totally decided upon, and is of course utterly secretive. TG: A lot of things that I've made have been assignment driven, but there is also a lot of freedom and it's all about how you interpret the assignments. So, I guess it's kindof a person thing, I don't want to be a product designer because I'm not interested in making products. So, I'm trying to intersect art, and design, and craft. I also just want to make things that make me happy, too. TSY: Elliot, how has your opinion of The Steel Yard changed since you've come here for the summer? EB: Absolutely everything about The Steel Yard has changed in my mind: I'm so glad that "fate" brought me here this summer, as I had no idea from afar how encompassing of all my interests the steel yard really was: public art, non-profit work, social responsibility, fabrication culture and education, and so on. These are all areas that are relevant and interesting to me, and I learned so much about each area, while working with my hands (something that maintains my sanity, and is, perhaps, necessary for my existence). TSY: Ok you two, here is my final question... it's a tough one! If you were a luchador (Mexican Wrestler), what would your wrestling mask look like and what would your name be? EB: I love Mexican wrestling! I think my character would be "The Machinist". He would wear a shop apron, and wear a respirator and safety glasses. His finishing move would be "The Counter-sink". I would whirl around quickly on top of my opponent, taking him to the floor. TG: I'd be the Patina Punisher. I'd wear a welding helmet, and my motto would be "I will corrode your surface!!" TSY: Wow, those are both amazing! I'd kindof like to see you two fight each other! Maybe this could be a new fundraiser!? !